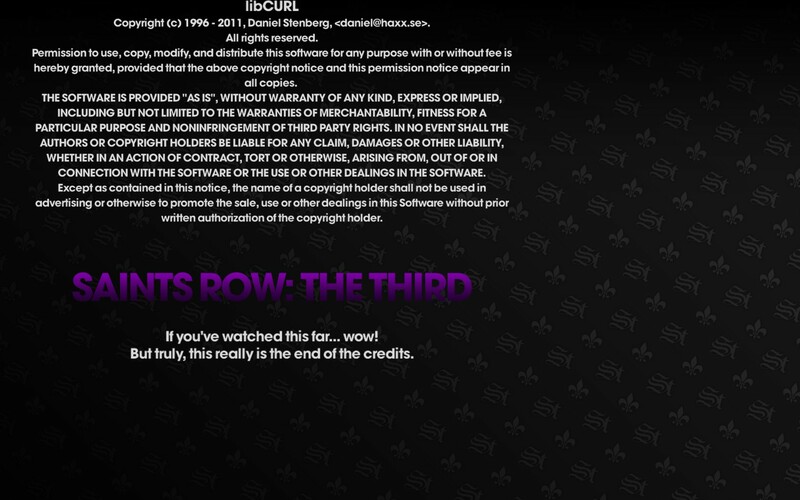 Saints Row: The Third (3 hrs) – I finished Saint’s Row: The Third in March. Overall, my enjoyment suffered a bit from a lack of play, but it was necessary due to planning for Scarlett’s birthday and starting a new semester of my graduate work. In the final mission you’re given a choice of pursuing Killbane or saving Shaundi. Angel de la Muerte asks you to go after Killbane because of their personal relationship, but I went after Shaundi because I thought that’s what my character would have done – he goes back with Shaundi way further than with Angel. Also, I was reading a walkthrough to help me get through the last mission as quickly as possible and (which influenced me to upgrade to the point where I could summon tanks and helicopters). So I knew I’d face off with Killbane in the Ganstas in Space DLC. The mission was awesome with “I need a hero” playing in the background as I raced to save her. It’s the perfect song for looping without getting annoying. But I felt the ending was way too anti-climactic. There isn’t even any fallout from Angel for having not chosen to pursue Killbane. Then I got to Gangstas in Space. The walkthrough I’d been reading didn’t mention it was essentially the movie the Third Street Saints were in. (I think it was mentioned throughout the game, but I’d forgotten) So while I DID faceoff with Killbane, it wasn’t a true battle. 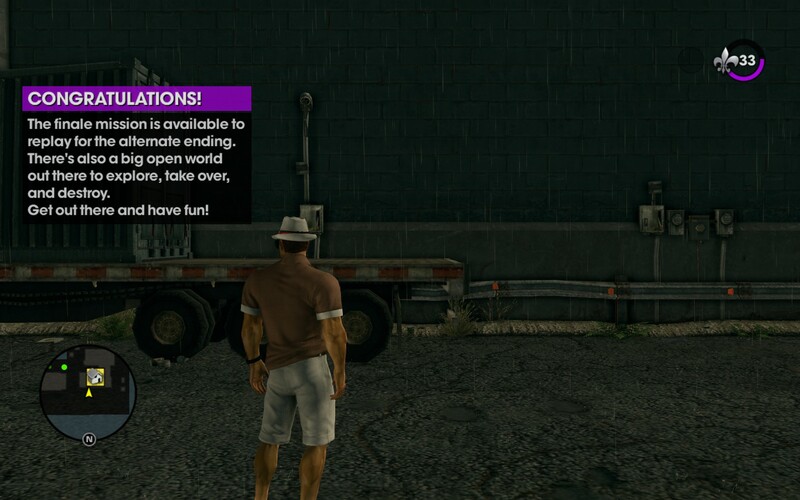 Over all, Saints Row: The Third was stupid fun. It was nice to essentially be able to do what I wanted consequence free. Because the game was essentially based on action movie violence (almost cartoon violence) you could do just about anything short of jumping off a building without activating a parachute and still survive. If there’s one thing I’ve learned in doing critical analysis of media, it’s that sometimes the creators can make a larger point about society – even unintentionally. Now, I haven’t read any interviews with the creators of the game, but while being an incredibly silly and profane game – it does make a very interesting point that I’ve heard addressed time and again on NPR about gang violence and the militarization of police. Now, the last two sentences were perhaps a little extra wordy – essentially my point is that this game is so ridiculous that I don’t know if they did this on purpose (The Daily Show style) or just chanced upon it. I mentioned before that as the game went on, the city was essentially put under martial law. After that happens you can see tanks and APCs rolling around the city as well as military airplanes that may attack you if they spot you. In later missions the city becomes a literal warzone. And I’ve heard a lot of people complain about a trend that started in the 1990s, but accelerated after 11 Sept brought a lot of extra money to states, that they have really militarized their police forces to the point that SWAT teams are called out when it should really just be a few cops. Of course, if the game was meant to be a commentary on this trend, it starts off strong, but falls flat on the execution. The citizens side with the military and against The Saints until the main character is able to clear some bombs from an important statue. Even in the worst times with the most militarization, the game never turns into Iraq the video game (Or some parts of Africa or pretty much any unstable country). Which is a missed opportunity on the one hand and probably asking too much of this goofy game on the other. Which means there may be some room as these socially conscious games continue to take off – if someone can take an open source 3D engine and show how crazy it can be when life is flipped around by a military presence and checkpoints and violence. It’s so weird to see Saints Row come so close before backing off. It was fun enough and I wanted to check it out after all the positive energy it got from the Giant Bomb guys, but I probably wouldn’t get the next game. Not because this was bad, but because I’d rather use my video game playing time to play other types of games. SR3 was good times. Ridiculous, but hilarious.